A once–famous but now struggling cartoonist returns yet again to teach another summer workshop at a middling New England college. It is a stale, flaccid artist–colony fête populated by similar has-beens, wannabes, B-listers, and a smattering of actually accomplished writers. Rich laments his “precocious success,” and his subsequent sinking into oblivion. “I’d had an appointment with destiny,” he says. 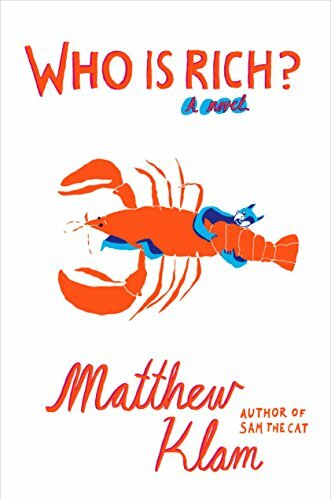 “I’d barely started, then I blinked and it was over.” Matt Klam’s fictional Rich Fischer reminds one of the New York Times’ Daniel Menaker to whom, curiously, the book is dedicated, as well as the New Yorker cartoon editor Bob Mankoff, reviewed here at NYJB. Autobiographical aspects of Klam’s own trajectory in this book are hard to ignore. In 2000, he was lauded as one of the New Yorker’s “Best Fiction Writers Under 40” for Sam the Cat, a collection of stories. The author in Who Is Rich? mines his own experiences, steals those of his wife, and shamelessly regurgitates the confidences of friends, “dumping in wholesale identifiable scenes and verbatim conversations.” Seventeen years ago, Klam’s relatives complained that he had exactly done this. Who Is Rich? is a cautionary tale perhaps on mining life for one’s art. And of giving one’s fantasies too much free rein.